With Mexico being one of the most hotly contested travel destinations in recent years, it should come as no surprise that Thompson Hotels has imported its brand of style and sophistication to the country’s azure shores. The group’s latest property, which opened recently in Playa del Carmen, is comprised of two parts: the main 92-room hotel, which offers all of La Quinta Avenida’s cosmopolitan creature comforts at its doorstep, and then the soon-to-open privacy-focused beach house that’s formed by 27 rooms and suites each armed with its own terrace, located along the shoreline. Designed by the local architecture firms AS Arquitectura and Seijo Peon, together with the interior designers Niz+Chauvet, Thompson Playa del Carmen harmoniously brings together mid-century Mexican accents with colourful geometric motifs and textures to create a vibrant, retro-tinged atmosphere. Austere elements, such as brushed concrete ceilings and a steel spiral staircase, are cleverly juxtaposed by warm wood accents and boisterous details, such as pressed tiled floors, woven straw pendant lamps and turquoise upholstered furniture. As with all Thompson Hotels, food and drink is a key component. 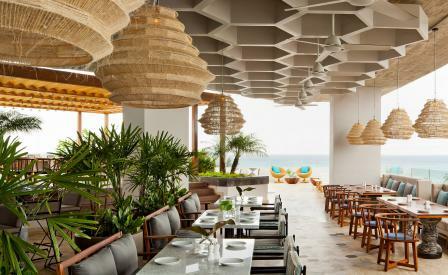 At Playa del Carmen, the hotel has transplanted Catch, the seafood-centric New York staple, onto its rooftop – the highest vantage point in the city. The rooftop also houses another restaurant Cinco, which doles out Mexcian-inspired cocktails and fare. Finished with an infinity pool, cabanas and garden-like landscaping, the aerial oasis is pretty hard to beat.